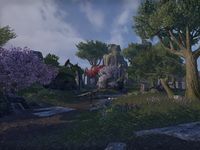 Errinorne Isle is a medium-sized island in central Auridon, just off the coast from the city of Skywatch. The island has become a Veiled Heritance training ground, where new recruits are tested to determine their potential. Rumor has it that the Veiled Queen herself will appear on the island, within the ruins of The Veiled Keep. A chapter of the book, Auridon Explored, and a welcoming pamphlet for new recruits can be found on the island. The island was used by the Aldmer as a shipping and warehouse complex for the city of Skywatch. 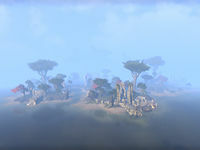 When the sload invaded Auridon, they occupied the island, until a force of the All-Flags Navy finally destroyed them, along with most of the island's buildings.